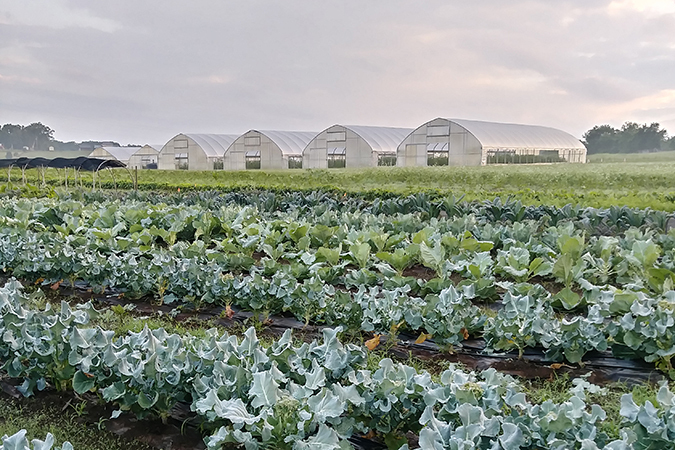 The East Tennessee AgResearch and Education Center, pictured above, will host the 2019 Organic Crops Field Tour on April 25. Preregistration is open until April 145. Image by S. Flowers, courtesy UTIA. The University of Tennessee Institute of Agriculture will present its Organic Crops Field Tour on Thursday, April 25. This spring event will equip home and commercial growers alike with tips and resources for planting, harvesting and processing organic fruits and vegetables. Other topics to be covered range from garlic and lettuce production to fruit crops. Organic disease control and soil biology will also be discussed by UT experts, with sessions on pollinators, community-supported agriculture and vegetable garden tips rounding out the day. Speakers include Extension specialists, county Extension agents, and other UT experts. Jim Brown, of Honey Rock Herb Farm in Louisville, Tennessee, will also be sharing his experiences with herb cultivation. Starting at 9 a.m., attendees will be able to register, enjoy refreshments and visit the exhibit tent. A short welcome will be held at 9:45 a.m., with the first of three half-hour sessions starting at 10 a.m. Morning sessions will repeat in the afternoon, and the day will close with a 45-minute question-and-answer session featuring all presenters. The event will be held at the Organic Crops Unit of the UT East Tennessee AgResearch and Education Center, located at 7315 Government Farm Road in Knoxville. The Organic Crops Field Tour occurs only every 18 months on the UTIA Field Day calendar, rotating from spring to fall, so producers interested in organic production are encouraged to attend. Attendees may register online. Preregistration is $10. Registration forms can also be downloaded and mailed, but must be postmarked by April 15 to receive the discounted preregistration rate. All registrations postmarked after April 15 and onsite registrations are $15. The cost of registration includes a catered lunch by the popular Knoxville restaurant, The Tomato Head. The Organic Crops Field Tour is the first of many field day events scheduled across the state for producers and the public to learn the most up-to-date farming, ranching and gardening practices. For more information about the 2019 UTIA Field Day Schedule visit the website for the UT Institute of Agriculture. Click on the link to field days and special events that appears on the “About UTIA” pull down menu.